Happy day-before-Valentine's Day gang. I am happy to announce a very special Great Readers Write today... One that is especially resonant for the holiday by longtime VKBMKL reader and children's book author Candice Ransom. Though still technically a children's book, it runs a little older than my usual demographic, but once you read, you'll understand why I made the exception. Enjoy. During a sixth grade blizzard, I waited in the school library for my bus to plow through snow-clogged roads and take me home. I pulled a book off the shelf, The Diamond in the Window, and settled down. It was past supper time when I slogged up the long hill to my house. I lost my loafers in the drifting snow, but kept a firm grip on The Diamond in the Window. That book had cast a spell over me. 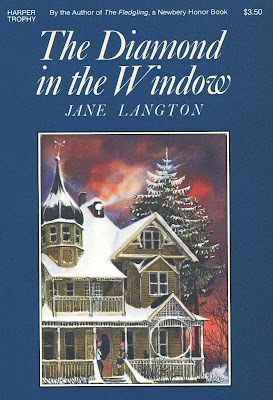 It had elements I loved: a Victorian house, a hidden treasure and drawings by my favorite illustrator, Erik Blegvad. Eleanor and Eddie Hall live in Concord, Massachusetts, with their aunt and uncle. Their house is about to be foreclosed. The kids notice a keyhole-shaped window and discover stairs leading up to a small room with two beds. Aunt Lily tells them her younger brother and sister played in that room. Wealthy Prince Krishna, a student of Transcendentalism, lived with them. One day the children disappeared and so did Prince Krishna. Eleanor and Eddie discover a huge fake diamond set in the window of the attic room. A riddle leading to “transcendental treasure” is etched in the glass. If they find the jewels, they can pay the taxes! But they really want to find the lost children. The kids sleep in the little room and experience strange dreams based on the riddle. The Diamond in the Window changed my life. I declared I was a Transcendentalist (that summer I made more declarations than Patrick Henry). I didn’t know Thoreau from Adam’s housecat, but I liked his writing. Emerson encouraged me to “Hitch my wagon to a star” and become a children’s book writer. I learned values and the truth, heady stuff for an eleven-year-old. My favorite chapter is “The Bride of Snow.” Eleanor, who pines for a Valentine, sees a young Aunt Lily and Prince Krishna in her dream. Krishna gathers snowflakes and fashions them into a wedding dress with the heat from his hands (so romantic!). He pricks his finger and a drop of his blood stains the bodice. He pins a ruby brooch over the spot. When Eleanor wakes up, she runs to the attic and unwraps a sheet covering a dressmaker’s dummy. There is Aunt Lily’s wedding dress, no two hexagonal lace pieces alike. The blood stain is there, but no ruby brooch. When I met my Prince Krishna, I had to be married on Valentine’s Day. We were, during the blizzard of 1979. 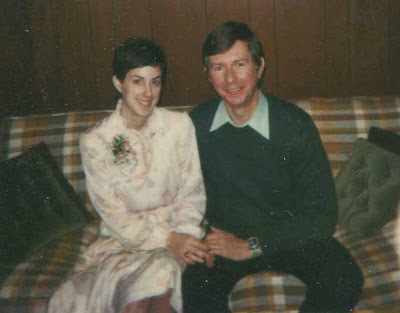 My dress came from Montgomery Ward. In our house, a crystal sketches rainbows on sunny walls. Lace curtains frame the windows, no two patterns alike. On Valentine’s Day, I display a vintage Valentine like the giant one Eleanor steps through in her dream. Five years ago on our 25th wedding anniversary, I wrote to Jane Langton and told her how her book had influenced my life. She sent an original drawing with her best wishes. We had planned to go away, but my husband had to work. I stenciled "Once Upon a Time" and "They Lived Happily Ever After" in the hall and fixed an elaborate fairy tale dinner that my husband, who had caught the flu, was too sick to eat. Our 30th anniversary will be this Valentine’s Day. We had planned to go to Scotland. Due to health and economy issues, we will stay home again. It’s our “pearl” anniversary. I am getting a single pink pearl, similar to the one Eleanor finds and wears to the belated wedding of Aunt Lily and Prince Krishna. Of course, my husband and I feel we already have found pearls, in each other. This was a lovely post! Thank you, and happy Valentine's day! Beautiful. I love your blog and had similar relationships with books in my childhood. Thank you. Oh my, oh my... I have been looking for this book for thirty years! I read it as a child and have thought of it over and over again, especially the chapter in which Eddie and Eleanor tussle in front of the doors, making life choices. You just made my year. I can't wait to find a copy and read it again. Thank you, thank you, thank you from all parts of my heart for writing this beautiful blog! I realize that you wrote to her already some time ago, but I would really love to try and write to her myself. How did you get an address to mail her? Is there any way I could get it from you? I understand of course, if that's not possible.